Tokes Platform Newsletter, January 2019 — Merchant Gateway RC1! Welcome to the first Tokes Platform newsletter of 2019! As we spent the entirety of 2018 primarily focused on development, we look forward to upcoming opportunities in 2019 to deploy our new releases — particularly, the Tokes Merchant Gateway. However, let’s not forget our other product offerings which we will be diligently finalizing and refining throughout the year — the EPCIS blockchain, eCommerce integrations for the Gateway, and Platform as a Service offerings. First, let’s discuss the imminent release of the Merchant Gateway release candidate 1 (RC1). 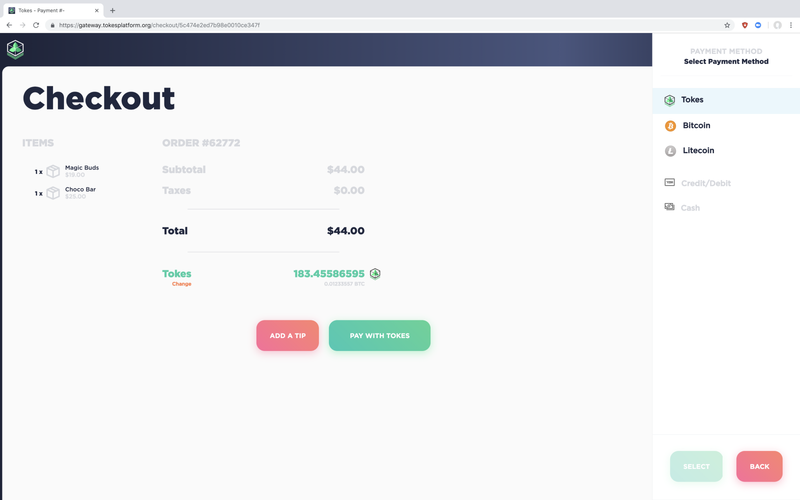 Bitcoin and Litecoin payment options: While the Gateway has had functionality for Tokes (TKS) payments at checkout since inception, we have integrated BTC Payserver functionality enabling payment checkout options for a number additional cryptocurrencies. While Waves transactions (and by proxy, Tokes transactions) have some of the highest network throughputs of any blockchain, we recognize that most merchants willing to accept cryptocurrency are going to want the ability to process the currencies with the widest adoption and highest market capitalization. For this reason, we have enabled Bitcoin Lightning Network and Litecoin payment functionality to the Gateway. This has been integrated within the existing workflow of the Gateway, allowing the merchant to specify receiving wallet addresses for Tokes, Bitcoin, and Litecoin upon first launch of the software; and then by easy drop down menu selection, the salesperson conducting the transaction just selects the appropriate token the customer wishes to pay with. In integrating BTC Payserver, this opens the door for additional token payments like Dash, which is targeting consumer payment adoption with their cryptocurrency. Further, this BTC Payserver functionality will be available in subsequent ecommerce iterations of the Gateway being released in the coming year. Pimcore Integration: Pimcore is a system for customer experience management, digital asset management, and product detail management which we are utilizing for scalability of the Merchant Gateway’s product category and inventory system. Fundamentally, this allows us to implement a more robust architecture around inventory without the limitations of a proprietary database for product management. Pimcore’s open source platform further allows us to integrate additional systems, like ecommerce integrations or the EPCIS Chain with the Gateway using a standardized and commonly understood framework of API integrations. Metrc Integration: Particularly relevant for cannabis dispensary deployments here in Nevada (and other jurisdictions), we are finalizing reporting integrations with Metrc, the software that manages the state’s sales data received from point of sale systems like ours. In finalizing this integration, the Tokes Merchant Gateway is now compliant with state regulations requiring daily reports of all cannabis sales made, for proper accounting and taxation records. Subsequent builds of the Merchant Gateway coming later this year will include a refresh of the dashboard widgets (i.e., more data visualizations of sales and records), integrations with current online ecommerce platforms like WooCommerce for WordPress in the way of APIs, as well as a full standalone plug and play ecommerce store we are tentatively dubbing Tokeify. Tokeify will allow users to quickly deploy an online storefront for their wares by simply adding their products and configuring the receiving addresses for payments. Given the recent BTCPay Server integration, this offering will have particular utility for payment processing outside of the cannabis space, but for any merchant wanting to capitalize on the growing consumer adoption of Bitcoin and other cryptocurrencies. The Tokes Platform founders will be in Park City Utah next week, giving product demos and discussing our product offerings on a panel in the Airthereum Flylounge & Tech Park located conveniently in the heart of the Sundance Film Festival on Main Street. In addition to product demos and discussions, we will have a screening of the Tokes Platform Documentary for Tech Park attendees. We encourage anyone in the area to reach out to us for a product demo or stop by the Flylounge & Tech Park to see what we’ve been working on. Tokes partner Vault Logic was at the Consumer Electronics Show earlier this month demonstrating the utility of the Vault Logic Kiosk for consumer acquisition of cryptocurrencies like Tokes (TKS). The Tokes team was at the conference as well to discuss our product offerings and network with potential clients and licensees. Vault Logic’s smart ATM garnered much interest from conference attendees (as usual!) and we were pleased to discuss the full workflow from smart ATM to Tokes Mobile Wallet, through Merchant Gateway. And Lastly, we are in the final weeks of the Tokes holiday token swap! That wraps up January’s newsletter, and we are excited to share with you the many updates upcoming in 2019!